Do I need a burial vault? The importance of an urn burial vault is clear is this example: An unprotected wooden cremation urn over time will more than likely weaken and collapse because of the moisture and the weight of the earth. 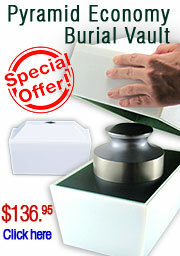 Some thin metal urns, ceramic cremation urns and glass urns will collapse over time as well. The ashes will typically be contained in a plastic bag within the urn however this will break down over time as well if exposed to moisture and mother nature. At the ground surface the urn collapse will usually results in a what is called a sunken grave. It is a difficult sight upon a family's visit as well as a maintenance problem for the cemetery. If you don't like the idea of this and do not want the ashes to disturbed by natural forces then you should purchase a vault to hold the cremation urn. The Mackenzie Cultured Marble Urn Vault is our first choice for ashes that will be buried. The urn comes in 27 colors (single and double "companion urn" models) and can be personalized with engraving. Our second choice would be any brass cremation urn that would fit in a standard inexpensive urn vault like the Pyramid Burial Vault.